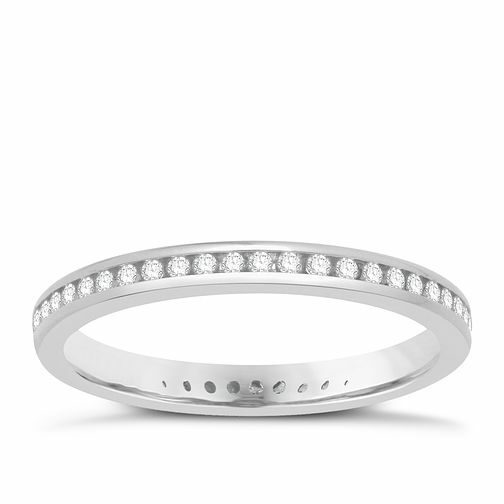 Platinum 1/4ct Diamond Full Eternity Ring is rated 4.0 out of 5 by 1. Rated 4 out of 5 by Anonymous from Dainty sparkle I wanted to own a platinum ring and a FULL eternity. This meets both my wants. So glad I don't have to worry about the ring spinning and being upside down due to the diamonds going around the entire ring. Also, I don't have to worry about re-plating as I do with my white gold items. I know it is only 2mm wide, but I like the understated daintyness which does catch the light and sparkles. Due to it's width, it doesn't feel cumbersome, and I am not aware of even having a ring on my finger. I went for one size larger on purpose to allow for swollen fingers in the heat and I find it extremely comfortable. Very happy with this ring.